Bake a ten inch round, one layer cake. Ice the cake in white buttercream icing. With white icing and star tip, size #18, make the shell border at the bottom of the sides of the cake. At the top edge of the sides of the cake do a shell border in black icing using star tip, size #18. Starting at the middle of the cake, put three curved diamond shapes connecting the bottom, top and side points (refer to the picture). Fill the top diamond shape with yellow icing using star tip, size #18.Cover the side diamond shape with red icing using star tip, size #18. 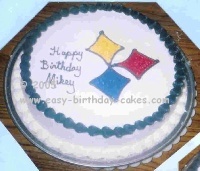 Cover the bottom diamond shape in royal blue icing using star tip, size #18. Outline all three curved diamond shapes in black icing using round tip, size #5. Write the message in black icing and the same #5 size round tip. Modify this cake for your favorite team logo.